Airspeed Online – Inverted Again! You are here: Home / Stephen Force / Inverted Again! This is a regular blog post. Check out the other posts for show notes and links to show audio. I finally got inverted yesterday for the first time since November. Yeah! About 1.7 hours with Barry Sutton in the Citabria yesterday. 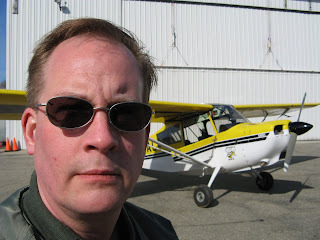 The mission was to get up and start rebuilding my aerobatic tolerance for the 2009 season and then continue with tailwheel training in the pattern. We started with wingovers of varying degrees until I was getting her up to about 60 degrees, burying the wingtip, and still pulling her out well below the yellow arc. The idea with the wingovers was to get some sense of energy management back after not having flown the aircraft for months. Six or eight of those until I was nailing them pretty well both left and right. Then we looped her. I do so love the loop. If I’ve been having problems, it’s been that I’ve relaxed the pull too early on the way up. Mostly, it’s getting a feeling of what it’s supposed to look and feel like in the airplane. This time, I think I nailed them pretty well. Good steady pull on the way up with only a little bit of letoff as I floated over the top and then begin the pullout as the horizon comes through the top (!) of the windscreen. On the back of the last one, I actually felt like the airplane rotated a little around its lateral axis. Not sure if that’s good (too much pull and stall risk? ), but it was an interesting sensation. This is a very capable airplane and we had plenty of altitude in which to recover, so I wasn’t worried. Additionally, I’m getting pretty good at managing the energy in each maneuver. On each of the last two or three loops, I kept the airspeed out of the yellow while still being pretty smooth. Barry says that the loops were good and round and probably looked impressive from the ground. In fact, he says that the average layperson would assume that we had out cheeks in our laps pulling gees. Heck, I think it’s impressive regardless, but understanding how it’s different in the airplane from what you see on the ground is an added benefit of doing this. I get a lot better idea of what I’m seeing at airshows. Aerobatic tolerance is about 20 minutes. Rotten. But I’m glad that I’m starting in early. I’d like to have it up to an hour of moderate aerobatics by early June. An organizer at one airshow that I’m covering this year says that he’s going to vet media riders in a Pitts S-2C before turning them loose to get media rides from the performers. Okay. (1) a Pitts S-2C ride is a great ride even if you never get past the vetting and (2) as long as I get to shoot and record in the Pitts, I’m good. Although I really do want to be the iron-stomached media rider who can handle whatever the performer throws at him. I had a chance to try out the new camera rig. It performed very well. 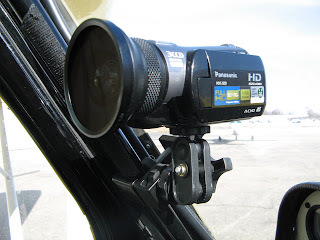 No gee-induced issues and the mount (from Pegasus Auto Racing Supplies) held the camera exactly where I wanted it. I put it on the tube to the upper left of the panel as seen from the front seat. The wide-angle lens gave a satisfactory breadth of view of the cockpit, but the sensation of motion wasn’t what I was looking for. I think I might need to mount it toward the center so that you get more outside view and get more of a sense of the aerobatic maneuvers. 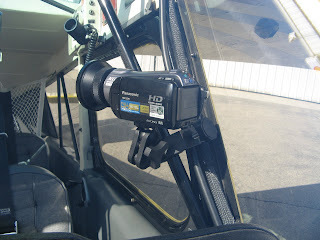 The camera proved easy to operate from the pilot’s seat. You can’t see the controls from the pilot’s seat, but they’re fairly easy to operate by touch if you’ve futzed with the camera a bit on the ground first. I managed to goof up the audio recorder during startup and didn’t record the intercom audio for this flight. So I’m going to have to use this footage for something else. But it’s good footage nevertheless. I’m looking forward to playing some more with the camera to figure out what works best. In any case, I don’t want to wait until it’s a really good flight opportunity to try to work out the bugs. I’ve just recently been approved by the Air Force for a really cool opportunity and I want all of the hardware working flawlessly when that gets scheduled. I have the new MacBook Pro and I’m getting acclimated to it. I’ll be installing the video editing software soon and I’m looking forward to posting some exampled of the in-flight video soon. More aerobatics and tolerance-building coming up! Stay tuned! How are you doing intercom audio? I’m doing it with a tiny bud mic stuck up into one of the headset ear cups, but it’s a bit annoying to have that wire dangling from my headset. I don’t imagine for a second that my loops are very round, but I do get a kick out of hitting my wash at the bottom of the loop. Kind of like when you hit your own wake after a 360 degree steep turn. That quiet moment at the top of the loop is one of my favorite times in flying, much like the base leg turn to final.